Announcement Hartsock Designs Jewelry is a fashion jewelry line handcrafted in Texas. I specialize in creating one of a kind handwriting, monogram, & name engraved jewelry and gifts. My jewelry is handcrafted to be modern, delicate, & feminine using high quality raw materials and an attention to detail. 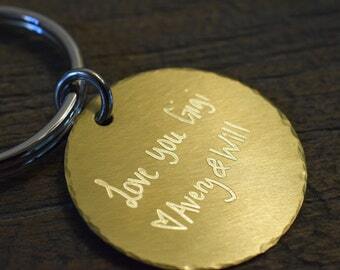 I am now featuring custom engraved gifts and jewelry. Choose from over 1K computer based fonts or use your own handwriting or artwork. The options are as limitless as your imagination. The custom handwriting engraving is only as good as the handwriting sample; the engraving is cut into the metal of choice and is darkened. Allow me make something beautiful, sentimental, and one of a kind just for you. 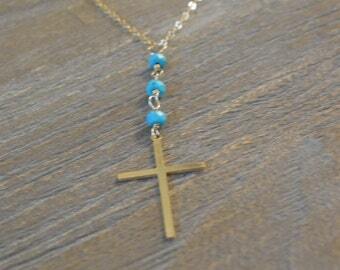 Please note that each piece of jewelry is handmade, finished, and loved; some variances may occur. No two pieces will be identical. No returns on custom/personalized pieces. Please view store policies & message me if you have any questions or special requests. I love special requests & custom orders. I also sell wholesale & by consignment to retailers; message me to discuss. I am now shipping all USA orders via Priority Mail which includes insurance up to $100. Any order over $100 or 14K solid gold will require signature confirmation for delivery. Processing time for most jewelry pieces is 3-5 days, custom engraved pieces may require up to 7 days and 14k solid gold pieces require 10 business days for completion prior to shipping. Hartsock Designs Jewelry is a fashion jewelry line handcrafted in Texas. 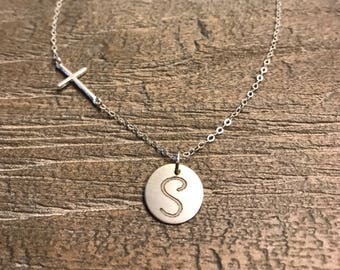 I specialize in creating one of a kind handwriting, monogram, & name engraved jewelry and gifts. My jewelry is handcrafted to be modern, delicate, & feminine using high quality raw materials and an attention to detail. A girl can never have too many hammers. Forming & hammering a sterling necklace. It all began several years ago, trying to make handmade gifts for my sisters for Christmas and in so doing I became fascinated with the creative process of jewelry making. Needless to say I was hooked. I became obsessed with teaching myself everything about jewelry design. Even in my sleep I dream about jewelry. In 2012, I began my ETSY shop from my dining room table, in between working my day job as a nurse practitioner, chasing after my two children and tending to my home and husband. Now I enjoy working in my studio in Texas. My jewelry designs have sold all over the globe and every day I am so thankful for my customers and the opportunities I am given. I choose high quality materials such as sterling & fine silver, 14K gold fill, pearls, semiprecious and precious gemstones, to design and create delicate, feminine, and modern everyday jewelry. I believe every woman is beautiful and I want my jewelry to enhance that special feeling. I love seeing the smile on my customer's faces & their stories of admiration of their jewelry. The best compliment from any customer is their repeat business or their referral of my business to a friend or family member. Now I am a jewelry artist, a small business owner, and a nurse practitioner. I am also a mother to two amazing young children and am married to a loving & supportive husband. I am happiest when I am in my studio with a torch in one hand and designing new jewelry pieces. 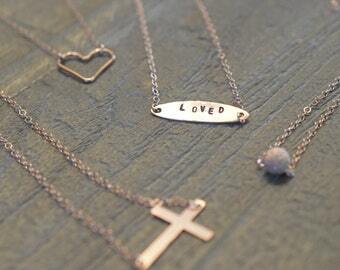 I lovingly handcraft each & every piece of fine jewelry in my studio in Texas. I enjoy using a variety of materials such as 14K gold filled, silver, gemstones, & pearls. I use wire work, soldering, & hammering techniques to create my jewelry.